2018 EU issue on 180g 2LP = Kool & the Gang Collected covers the music from their funk, soul, rock, jazz and disco period, with hits "Hollywood Swinging", "Open Sesame", "Ladies Night", "Celebration", "Get Down On It", "Joanna", "Fresh", "Cherish"
2018 EU issue on 180g 2xLP = Kool & the Gang Collected covers the music from their funk, soul, rock, jazz and disco period. "Hollywood Swinging", "Open Sesame", "Ladies Night", "Celebration", "Get Down On It", "Joanna", "Fresh", "Cherish". In a career spanning over 50 years the American band Kool & the Gang recorded an impressive list of hit songs and hidden gems, now bundled on our exclusive Collected record. In a career spanning over 50 years the American band Kool & the Gang recorded an impressive list of hit songs and hidden gems, now bundled on our exclusive Collected record. 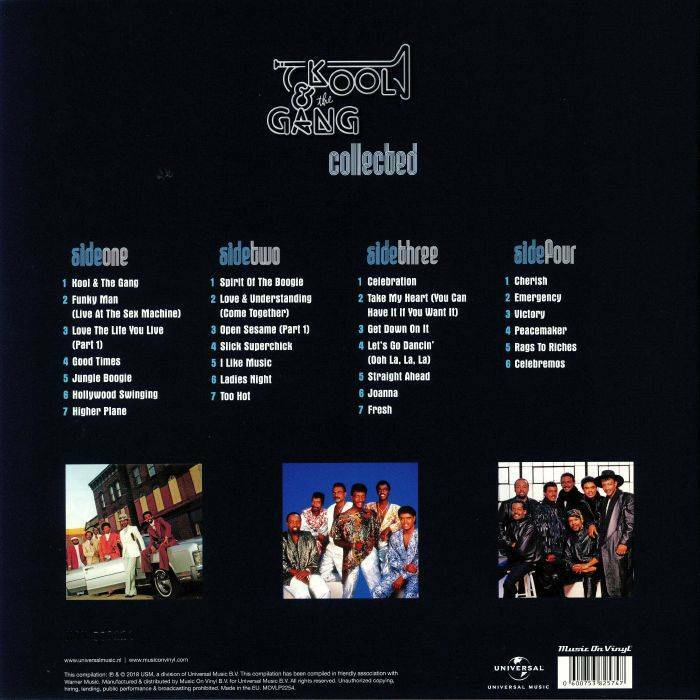 Kool & the Gang Collected covers the music from their funk, soul, rock, jazz and disco period. 27 songs in which you'll hear their musical diversity and the energetic and positive sounds they brought to a worldwide public. After recording three album Kool & the Gang had commercial success with the singles "Jungle Boogie" and "Hollywood Swinging". It meant the start of a fantastic career, in which they reached their highlights at the end of the '70s and beginning of the '80s. Hit singles like "Ladies Night", "Celebration", "Get Down On It", "Joanna" and "Fresh" are among their most famous songs and are all included on this double LP. With their fantastic set of bulletproof funk and jazzy arrangements they influenced the music of three generations. They continuously performed during the pas 45 years and remains one of the most active touring bands, performing hundreds of shows every year.